Mandy Rose faced The Empress Asuka this week on Smackdown Live with an impressive showing. Smackdown Women’s Champion Carmella was on commentary. Mandy made her entrance with some new stage graphics, and a unique custom nameplate. During Asuka’s entrance, she was blindsided by Sonya Deville, Mandy was taunting Asuka, and telling her to get into the ring. Asuka looking beaten up, argued with the referee telling him she was able to compete. The bell rings and Mandy picks up Asuka and places her in the corner, and Asuka meets a flurry of forearm smashes, followed by a flurry of kicks to the midsection. Asuka attempts to retaliate, but Rose is able to get the upper hand and shuts Asuka’s attempt down. Mandy grabs Asuka by the hair and brings her to the middle of the ring, where The Empress then begins fighting out of Rose’s grasp, kicking Mandy a few times before attempting one last one, where Mandy is able to catch her and deliver a powerful inverted exploder suplex. Mandy goes for the cover and gets a two count. Rose then locks Asuka in a cross armed crossface, with her knee in the back of Asuka. Asuka starts to fight out of it, but Rose gives Asuka a knee to the mid section, before whipping her into the corner. As the Empress bumps off the turnbuckle pad, she’s met with a dropkick from Mandy. Mandy then does her seductive crawl, laughing at Asuka before she gets up, and delivers her signature Bicyle Knee strike, attempts to put away the Empress, and achieves a two count. Rose taunts the audience,before the match cuts to commercial. After returning from commercial, Asuka has Rose in her grip, the competitors start to exchange forearm blows, and Asuka gets the better of Mandy and delivers the Empress Combination of kicks and strikes, before she delivers a devastating knee strike to Mandy’s skull, followed by a slap, and then Asuka’s signature sliding kick. Rose attempts to get herself back to her feet in the corner, but is quickly regretting that decision as Asuka attacks her with a corner hip attack. Asuka then climbs the turnbuckle, and meets Mandy with a missile dropkick. Asuka goes to cover Rose and achieves a two count. Asuka, trying to get some more momentum behind her goes for a hip attack to Rose, who is leaning against the ropes, Rose evades it and Asuka gets stuck in the ropes, where Mandy is able to take advantage and takes Asuka down with a clothesline in the middle of the ring, she then sets the Empress for her wheelbarrow face buster, but Asuka is able to roll up Mandy and achieve a two count, as Mandy kicks out, she lands in front of Asuka, and Asuka sets up for the Asuka lock, where Rose has to submit. Becky Lynch def. Mandy Rose and Sonya Deville to qualify for the Women’s Money In The Bank ladder match. Becky Lynch, Mandy Rose & Sonya Deville do battle to fight for one of the few remaining spots in the Women’s Money In The Bank ladder match. The match begins with Lynch looking strong, a strike to both Deville & Rose and then tosses Mandy out of the ring. After an impressive showing, Mandy is back in the ring and she helps out her friend Sonya Deville, as she’s being weakened down by Lynch. The two deliver an aggressive beat down to Becky. She attempts to retaliate, but Mandy is able to deliver an impressive looking slam, followed by a knee to the midsection from Deville. Mandy and Sonya stand tall, before Mandy betrays Deville, with a roll up attempt that achieves a one count. The two argue before the match cuts to commercial. After returning from commercial, Sonya is standing strong, both Mandy & Becky are down. The camera focuses on Sonya’s face portraying an intimidating expression, staring down at Rose. Rose rolls out of the ring while Deville and Lynch begin wrestling back and fourth until an impressive top rope knee strike from Deville, she attempts to pin Becky, but Mandy is back in the ring and able to remove Deville from the equation by tossing her out of the ring, Rose attempts to steal the pinfall from Deville’s offence but is only able to achieve a two count. Mandy gets up with Becky and attempts to deliver a suplex, but Becky is able to turn it into a cradle pin, and lands a one count. Rose attempts her signature bicycle knee strike, but Becky has the wherewithal to dodge it, and she catches Mandy by the arm, attempts her finishing move the Dis-Arm-Her, but Mandy is able to keep Becky on her feet long enough to place Becky in the corner turnbuckle before delivering a face smash into the pad. With Lynch dazed, The Golden Goddess is able to set up her finishing move, Bed of Roses. She goes to cover Becky, but Sonya is back in the ring and pulls Mandy away, before attempting to steal Mandy’s pinfall, similar to what Mandy attempted earlier in the match. She achieves a two count, then removes Mandy from the ring. Sonya and Becky begin fighting back and fourth again. Deville goes for a top rope suplex, before Mandy interrupts and catches Deville on her shoulders. Sonya attempts to break out by delivering strikes to Mandy’s skull. Lynch jumps off the top rope and kicks Mandy in the midsectio, and the three women are grounded. Lynch takes the opportunity and attempts to pin Mandy, and Mandy kicks out at two. The two, clearly groggy and tired begin trading back and forth forearms. Rose is able to get the upper hand and once again goes for her Bed of Roses finishing move. In the air, Lynch is able to bring herself back down to the ground, and then attempts to lock Rose in the Dis-Arm-Her, before Deville is able to break it up with a kick to Lynch’s chest. She then kicks Rose in the chest, and she rolls under the rope, then delivers a knee strike to Becky Lynch, pins her, and achieves a two count. Sonya then attempts to suplex Becky, but Becky is able to reverse it and try her own, but Deville lands on her feet. Out of nowhere, Mandy is able to come back with her signature bicycle knee, she aims for Becky but Lynch moves out of the way, and Mandy catches Sonya with the knee. Lynch attempts to take advantage by rolling up Mandy, but Mandy is able to reverse it and roll Lynch up herself, she achieves a two count before Becky is able to reverse out and locks Rose in the Dis-Arm-Her, Mandy tries her hardest to get herself to the ropes, but she’s unsucessful and gives in, resulting in a tap out. Becky Lynch advances to the Money In The Bank ladder match, but what could this mean for best friends Mandy & Sonya? This week we finally got to see Mandy Rose make her Smackdown Live In-ring debut, and what a debut it was from The Golden Goddess! The match began with Mandy Rose & Sonya Deville having a conversation in the gorilla position. Mandy tells Deville ” Paige was right, it’s time for us to stand on our own two feet” just as she’s about to exit to the stage, Smackdown Live General Manager Paige pulls them aside, she asks Sonya “You’re not about to go out there with her, are you?” Sonya nods, and Paige exclaims “Absolution is dead” just like she said last week. Rose & Deville retaliate, telling Paige “We heard you last week” “You can desert us for this new office job, but we promised we will never abandon eachother. Paige then informs the two that Sonya is barred from ringside.. the two retaliate and Mandy tells Sonya to just come on out anyway. The screen cuts back to Becky in the ring, and the fun begins. We hear a seductive “Mandy” whispered through the arena. 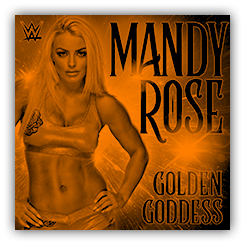 The stage is filled with vibrant orange graphics that read “Mandy Rose”. Mandy’s new theme song begins, and she emerges from the minitron.. alone. 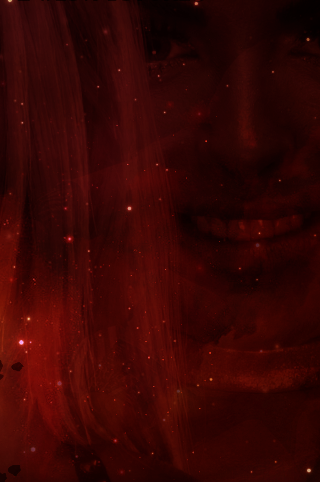 The sides of the screen then begin to blur, and all the focus is all on Mandy Rose. Her entrance is quite unique, she takes a step, stops, poses, and takes another step, she repeated this until she gets to walk-way of the stage. She then walks towards the apron, and does her signature apron pose we’ve seen before. The match begins. Mandy quickly applies a waist lock to Becky and Becky throws Mandy off with a hip toss, followed by a takedown. Rose rolls out of the ring to regroup, as soon as she gets back in Lynch attempts to apply her signature submission, Dis-Arm-Her, but an attempt is all she achieved. She was met by a strong forearm smash from Mandy, before she places Lynch in the corner. “Who do you think you are, huh? !” Mandy says to Becky before she delivers kicks to the mid section of Becky while she’s trapped in the corner. Mandy then whips the lass kicker into the opposite corner, and delivers an impressive running dropkick. Mandy then crawls back in the seductive way she does, before Becky meets Mandy’s signature bicycle knee strike. Rose attempts a pinfall and Lynch kicks out at the count of two. Frustrated, Mandy applies an aggressive chin lock to Becky while both are grounded. Lynch begins fighting out of the hold, but she is quickly sent back down the mat via a hair-pull mat slam. With Becky dazed, Mandy starts taunting her “What’ve you got Becky, huh?” and then an unsuspecting Lynch meets an aggressive fist from Rose. The two begin exchanging right hands, and Becky begins retaliating, ending the series with an uppercut. In retaliation, Mandy attempts to deliver a forearm smash to Becky, but Lynch is able to get the upper hand and for a second time attempts to apply the Dis-Arm-Her, but Mandy is able to crawl to the bottom rope just in time. All isn’t safe for Mandy however, as Lynch catches Mandy off guard with a Bexploder, followed by a forearm strike to a cornered Rose. She then attempts her signature cornered kick, but Mandy is able to catch Becky’s leg in the air and denies any offence from The Lass Kicker, Rose shoves Becky’s leg down and catches her on the rope and rolls up Becky for the pinfall victory. Becky looks extremely upset in the ring, but Mandy is busy celebrating on the stage, before she walks backstage. The rest of the Smackdown Women’s division should be paying attention to Mandy, the future is most definitely Golden..